A lady with one of the warmest hearts you’ll ever encounter went to heaven on one of the coldest days in Wisconsin’s recorded history. 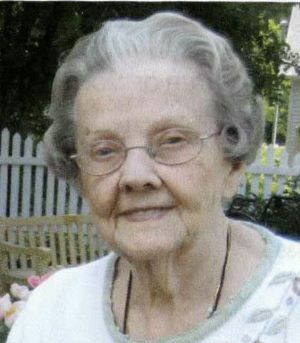 Margaret D. Alf, age 95, of Ripon, Wis., passed away on Tuesday, January 29, 2019, at Wolverton Glen in Ripon. Margaret was born September 5, 1923, on the Bloch Farm in rural Green Lake, Wis., to Gottlieb and Amelia (Weiss) Bloch. Both of her parents immigrated to America after leaving Russia. The pair met after arriving in their new homeland of Wisconsin. Margaret graduated from Green Lake High School and went on to further her education at Milwaukee School of Cosmetology. On November 27, 1945, Margaret married Alfred A. Alf in Green Lake. She worked as a homemaker and helped Alfred on the family farm. In her earlier years, Margaret was involved in the 4-H Community Club. In 1966, she worked at Ron’s Diner in Berlin and absolutely loved meeting and talking with the people that came in to eat. Margaret was a member of Messiah Lutheran Church in Ripon. Survivors include four children, Theo (Pete) Knigge of Omro, Wis., Dennis (Mary) Alf of St. Charles, Ill., Tom (Nancy) Alf of Ripon, Wis. and Curtis (Tammy Hage) Alf of St. Charles, Ill.; grandchildren, Krista Knigge (Corey Geiger) of Mukwonago, Wis.; Charlie Knigge of Omro, Wis., Mary Knigge (Brian Mano) of Rockville Md. ; Michael Alf (Katie) of Batavia, Ill.; Steven Alf (Shannon) of Madison, Wis.; Jenny Hansen (Justin Hansen) of Chanhassen, Minn.; Lynsey Alf (Jeff Goodroad) of Chaska, Minn.; Erin Hinz (Justin Hinz) of North Mankato, Minn.; Alexandra Alf and Bryan Jacob Alf of Bloomington, Ind. ; great-grandchildren, Jacob Knigge, Cooper and Jolene Mano, Sarah and Ryan Alf, Sofia and Spencer Alf, Braden and Kyan Hansen, and Gideon Stuckmeyer and Asher Hinz. Margaret was preceded in death by her parents Gottlieb and Amelia, and her husband, Alfred. The youngest of the family, all nine of Margaret’s siblings also proceeded her in death: Reinhold, Emil, Gustave, Edna, Nona, Edwin, Otto, Bernard, and Berthold Bloch. Visitation will be held on Thursday, February 7, 2019, 10:30 – 11:30 a.m. at Messiah Lutheran Church, 500 Mayparty Drive, Ripon, Wis. 54971. Funeral Service for Margaret will be held on Thursday, February 7, 2019, at 11:30 am at Messiah Lutheran Church in Ripon with Reverend Bryan Fritsch officiating. Interment will be held at Dartford Cemetery in Green Lake. A memorial is being established in Margaret’s name.